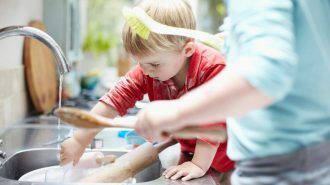 With summer around the corner, you may already be in full planning mode for your next camping adventure. If you’re still on the fence on where to go, we’ve put together a short list of (arguably) the 10 best campgrounds on the west coast. 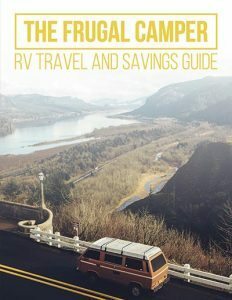 With so many amazing west coast campgrounds to choose from, it was quite a chore to narrow the list down to 10 campgrounds. Okay, we just couldn’t’ do it so we added 2 more to make it a list of 12 best west coast campgrounds. And the more we think about it, we probably could add a bunch more so let’s get started. Most of these campgrounds are located right on the coast/ocean, with the exception of maybe a few that are a little inland. Keep in mind that you should reserve a campsite as soon as possible because most (if not all) of the campgrounds on our list will be in high demand. 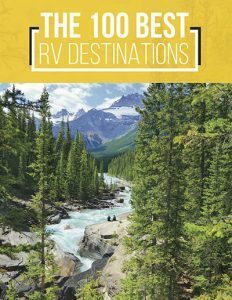 Our list (and journey) begins with the southernmost campground we think deserves a spot in the “12” best campgrounds on the west coast. From there, we’ll head north from California into Oregon and finish in Washington. San Elijo State Beach is easily the best ‘ocean/beach’ campground on the west coast. Boasting beautiful Mediterranean-type weather most of the year, this 171-site campground sits on a bluff overlooking the Pacific Ocean with easy access to a sweet sandy beach. The ocean temps are warm in the summertime (averaging mid 70s), the surf break is world famous, there’s probably a dozen great restaurants within walking distance and most all of San Diego’s most popular attractions are within a 45-minute drive. Other outdoor recreation includes beachcombing, body boarding, swimming, fishing, kayaking, biking and wildlife viewing (including migrating whales at certain times during the year). The campground has hot showers, flush toilets, a camp store, restaurant, amphitheater, dump station and even a ‘doggie beach’. Each campsite has a table, fire ring and grill. 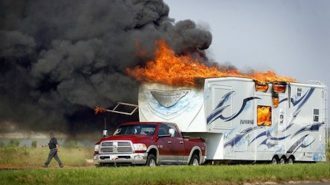 Some campsites have RV hookups. 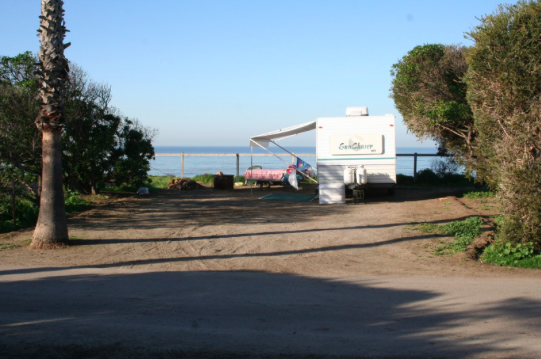 Check HERE to see campsite photos at San Elijo State Beach. 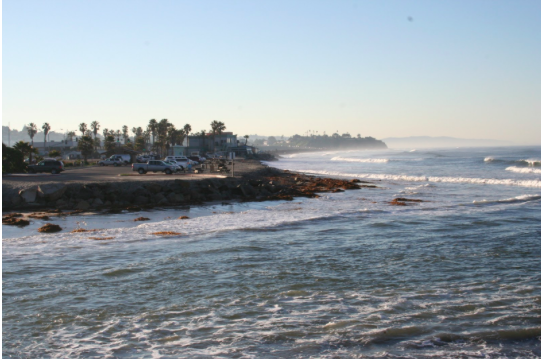 Doheny State Beach campground is located on 62-acres of some pretty prime Southern California real estate in Dana Point/Orange County. The campground is in the southern end of the park and sits right on the beach. 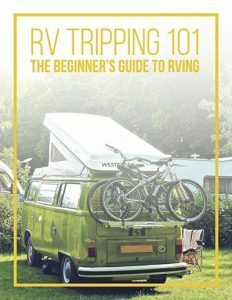 There are 121 campsites (about 55 beachfront) for RVs, trailers and tents. Group camping is also available. The campground also has an amphitheater; dump station, hot showers and flush toilets. The northern part of the park includes a 5-acre lawn with picnic facilities and volleyball courts. 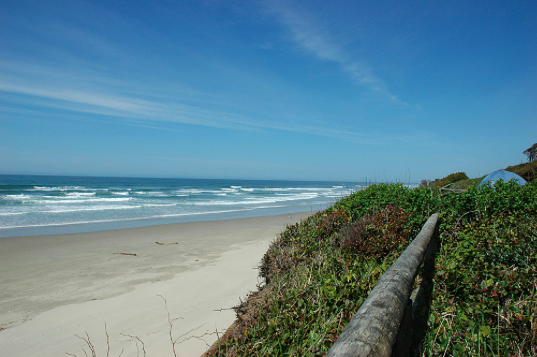 The large sandy beach is popular for sunbathers, surf-fishers, beachcombers and surfers. What’s really nice about Doheny State Beach is that it offers a great base-camp to hit the many attractions in Orange County (like Disneyland). Dana Point harbor is about a mile walk (or bike ride) from the campground and has some pretty nice restaurants and shopping. You can also find rentals for kayaks, paddleboards and sail boats at the harbor. 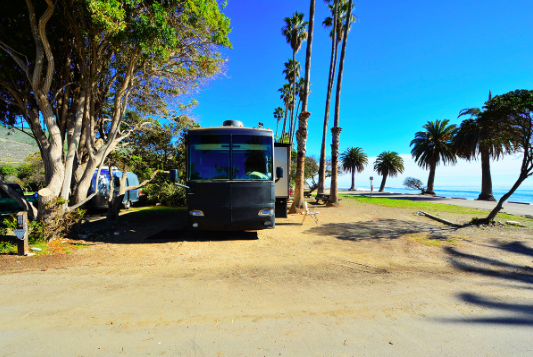 Check HERE to see campsite photos at Doheny State Beach. 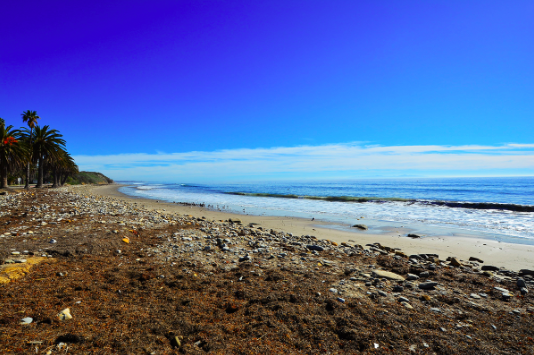 Just west and a little north of Santa Barbara along highway 101 you’ll find the idyllic campground of Refugio State Beach. 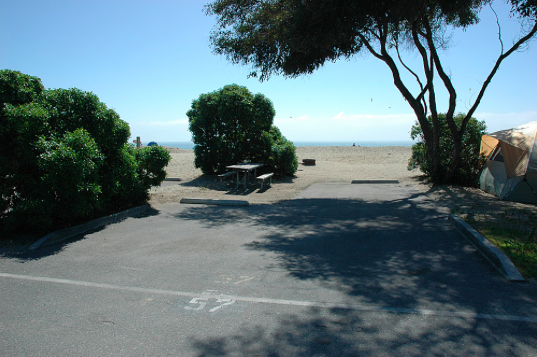 The campground has 66 campsites very close to a beautiful beach. This is a great place to view the Channel Islands, migrating whales, beachcomb, surf, swim, fish, kayak, snorkel, check out the tide pools or just relax. You can also get some nice biking riding in as a trail connects to El Capitan State Beach to the east. 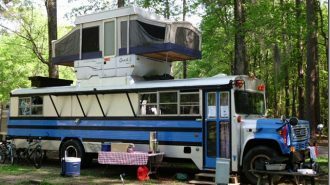 Although the campsites are a bit snug, there is great demand for this campground. It’s also a nice base camp to visit Solvang (15 miles away), Santa Barbara or even knock out a hike to Gaviota Peak (2,450), which offers superb views of Santa Barbara County, Point Conception and the Channel Islands. The campground has hot showers, flush toilets and a picnic area. 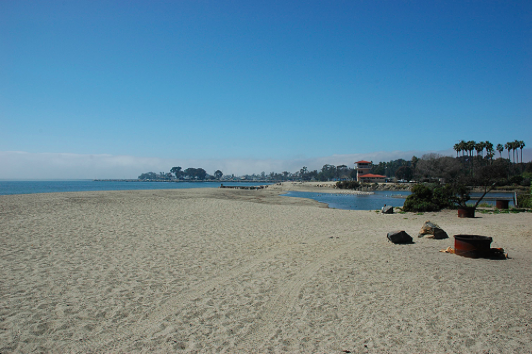 Check HERE to see campsite photos at Refugio State Beach. Located next to the beautiful coastal town of Morro Bay, Morro Bay State Park offers plenty of activities to keep you busy. You can visit the Museum of Natural History, kayak in the bay, sail, beachcomb, explore the dunes, hike or bike on a variety of trails, spend a day shopping in the village, go deep sea fishing, whale watching or play some golf. 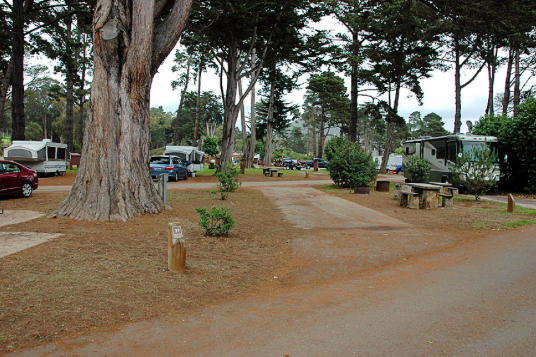 Morro Bay State Park campground has 134 campsites and each has a table, fire ring, grill and food locker. Some campsites are designated as hike/bike campsites. The campground has flush toilets, hot showers, a dump station and two group camping sites. All sites are paved and 27 sites have hookups for water and electricity. 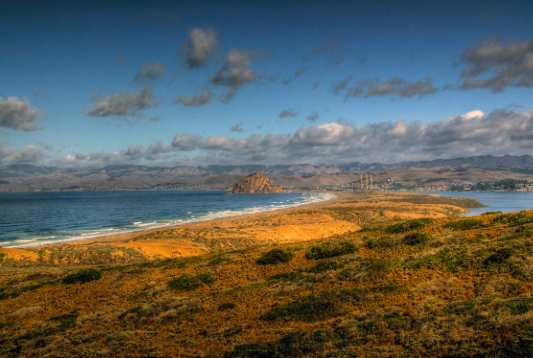 Check HERE to see campsite photos at Morro Bay State Park. With 1,006 acres of redwoods, conifers, oaks, maples, cottonwoods and alders – plus beautiful open meadows – visitors often refer to Pfeiffer Big Sur State Park as a “mini Yosemite’. 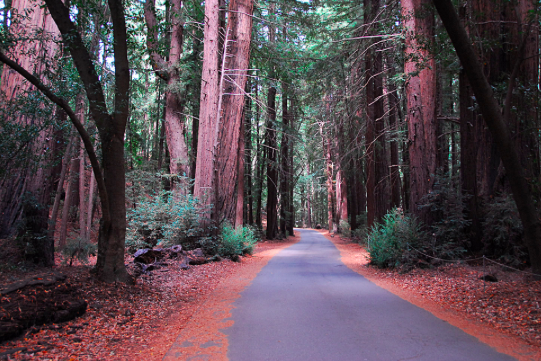 It offers miles of scenic hiking trails through redwood groves and offers spectacular views of the Big Sur area. The Park is located about 5 miles from the Pacific Ocean which can be reached by car or by hiking a trail along the Big Sur River to the coast. 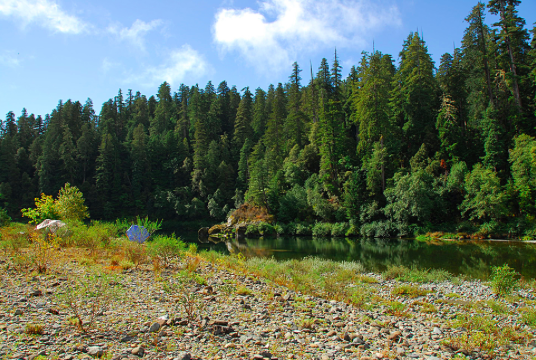 The campground has 184 campsites (for RVs, trailers and tents) located on the valley floor through where the Big Sur River flows. The campground has flush toilets, hot showers and WiFi! There’s also a camp store to load up on snacks and supplies. 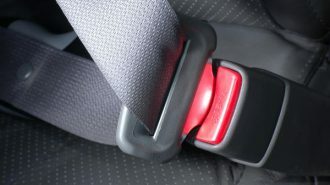 And don’t forget to spend some time cruising Highway 1 and seeing the sites like Pfeiffer Beach, McWay Falls, the Bixby Bridge, Ragged Point and the various little towns, spas and art galleries. 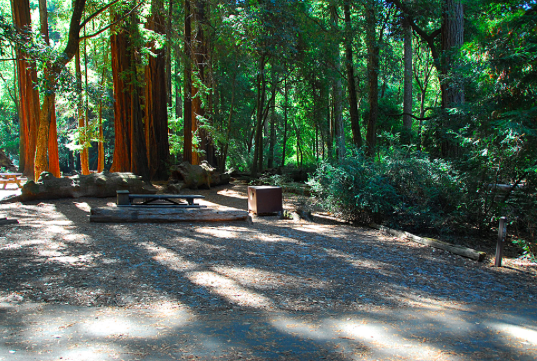 Check HERE to see campsite photos at Pfeiffer Big Sur State Park. Big Basin State Park is California’s oldest State Park and has more than 18,000 acres to explore from the ocean up to an elevation of 2,000 feet. The big attraction here is a rare stand of ancient coastal Redwood trees that are among the tallest and oldest trees on the planet. Visitors will also enjoy spectacular views of the Pacific Ocean, lush waterfalls and miles of roads and trails to explore. 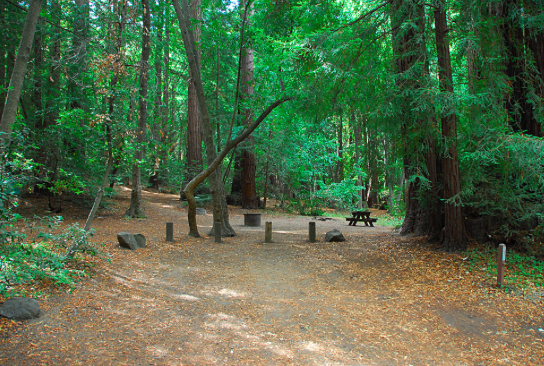 The campground has 183 single-family (RV, trailer, tent) campsites set among a heavily wooded area with the majority of the campsites shaded by Redwood trees. The campground has flush toilets, hot showers, a dump station and visitor center. Each campsite has a table, fire ring, grill and food locker. There are no hookups at this campground. 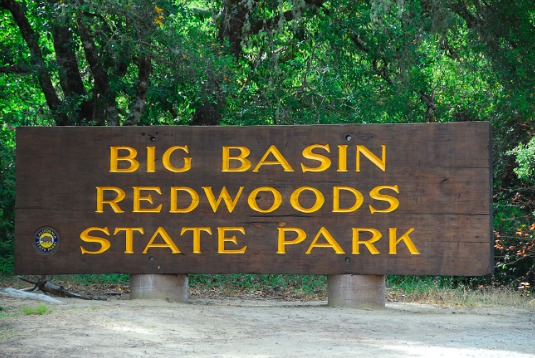 Check HERE to see campsite photos at Big Basin Redwoods State Park. Designated as a World Heritage Site and Biosphere Reserve, Jedediah Smith State Park features 10,000 acres of old growth coastal Redwoods. 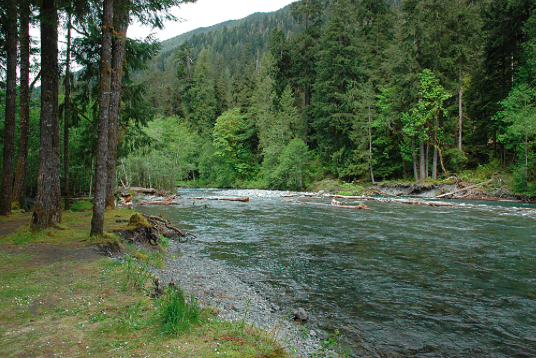 The Park is home to a variety of wildlife including the Salmon and Steelhead trout, which run in the Smith River and Mill Creek in the fall and winter. The Park has an interactive visitor center, miles of hiking trails to explore and a beautiful campground adjacent to the Smith River. 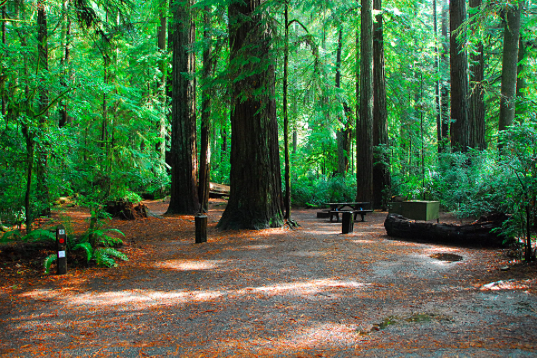 The 106 campsites are set among the old growth Redwoods and have a table, fire ring, grill and food locker. The campground has modern restrooms including flush toilets and hot showers. There is a dump station, but no hookups. HERE to see campsite photos for Jedediah Smith Redwoods State Park. 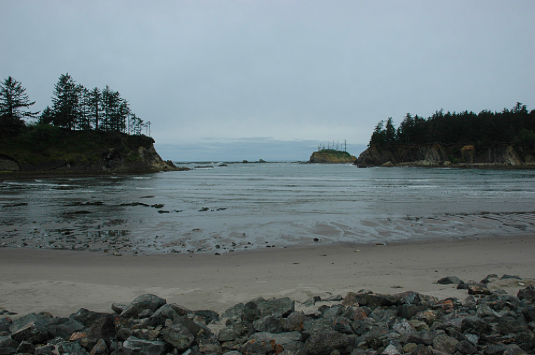 Moving across the border to Oregon, Sunset Bay State Park is situated in one of the most scenic areas on the Oregon coast. It features spectacular sandy beaches protected by towering sea cliffs. Outdoor recreation activities include hiking, beachcombing, biking, picnicking, fishing, crabbing, clamming and wildlife viewing. There’s also a public golf course located next to the park. 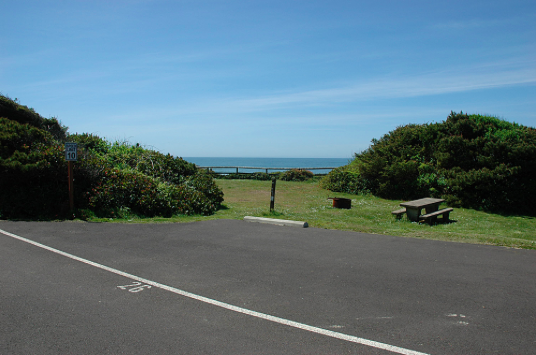 The campground is a short walk to the beach and has 29 full hookups, 34 electric hookups and 66 tent sites. There are also 8 yurts and a group camping area. HERE to see campsites photos at Jedediah Sunset Bay State Park. 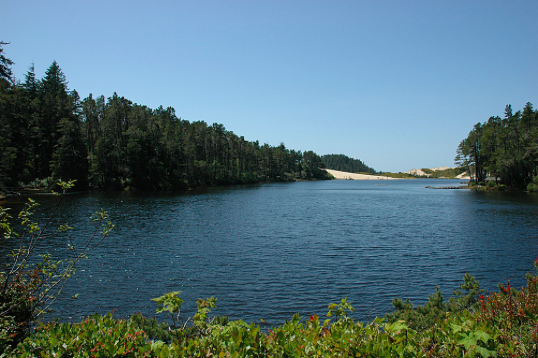 Featuring two miles of sand dunes between the park and the ocean, Jessie Honeyman State Park is the 2nd largest campground in the state. There are 416 campsites for RVs and tents, as well as 10 yurts and 6 group sites. It’s a big campground, but it is nicely laid out and set among a grove of towering trees. The campsite pads are paved and each has a table, fire ring and grill. The campground has flush toilets and hot showers. The Park has two freshwater lakes great for fishing, swimming and boating (pedal boats, canoes and kayaks available for rent) a visitor center, store, gift shop, equipment rentals, a playground and picnic area. Other outdoor activities include OHVing, exploring historic sites, hiking, biking, beachcombing wildlife viewing. 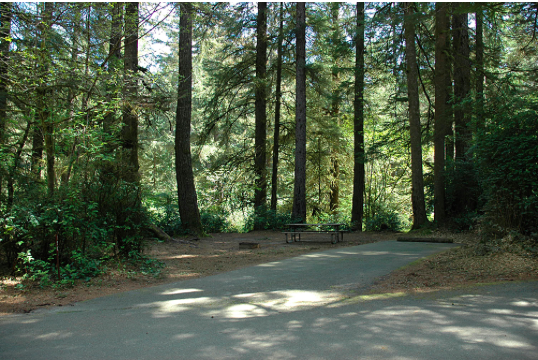 Check HERE to see campsite photos at Jessie Honeyman Memorial State Park. 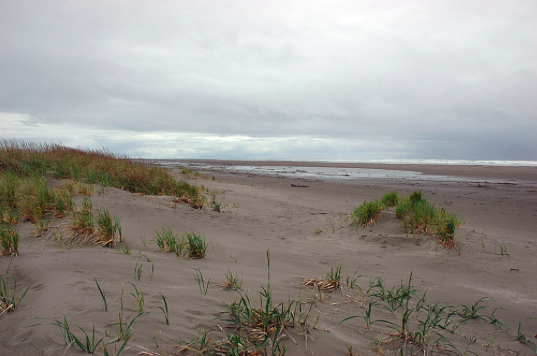 If you want to camp right on a big beautiful Oregon beach, then Tillicum is the place for you. The campground is right next to the beach and has 60 spacious campsites (all with paved pads) and most have beachfront views. 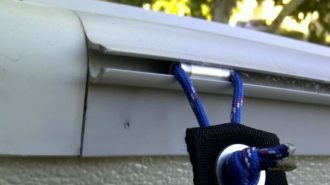 There are a few that have electric and water hookups. Each campsite has a table and fire ring. The campground has flush toilets, but no showers. Outdoor activities include swimming, surfing, fishing, beachcombing, hiking, biking and wildlife viewing. 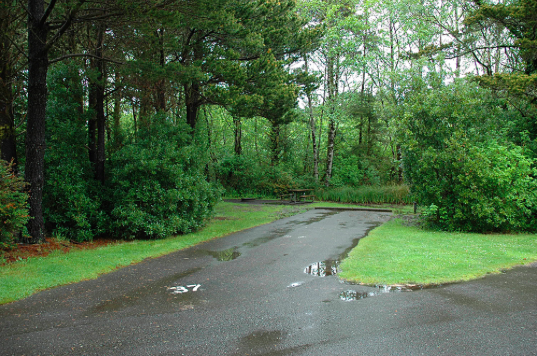 Check HERE to see campsite photos at Tillicum Beach campground. Grayland Beach State Park is a 412-acre marine camping park with approximately 7,500 feet of spectacular ocean frontage. It is located just south of the town of Grayland and is world famous for its kite flyers and kite-flying observers! It’s also a great place to enjoy one of Washington’s beaches, do a little clamming, fishing, picnicking and wildlife viewing. The campground has 58 full hookup sites, 42 with water and electric, 16 yurts and 4 primitive tent sites. The modern restrooms have flush toilets and hot showers. There’s also a dump station at this campground. Each campsite has a table, fire ring and grill. 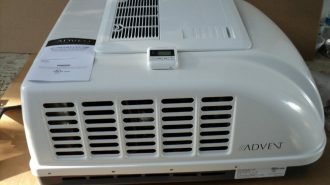 Check HERE to see Grayland Beach State Park campsite photos. Mora campground is the last and furthest north on our list of best west coast campgrounds and is located in Olympic National Park (a little bit of a drive from the coast). Olympic National park features three major ecosystems and almost a million acres to explore and experience nature including breathtaking mountain vistas, meadows of colorful wildflowers, a rainforest with ancient trees (some towering 300 feet tall) and ocean tide pools. 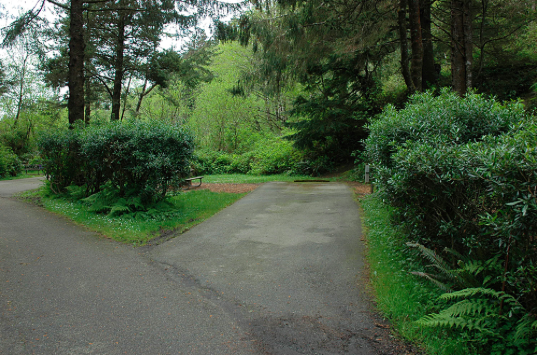 Mora campground has 94 multi-use campsites set in an old growth forest along the Quillayute River about 2 miles from Rialto Beach. The campground does not have hookups or showers, but has flush toilets and a dump station. 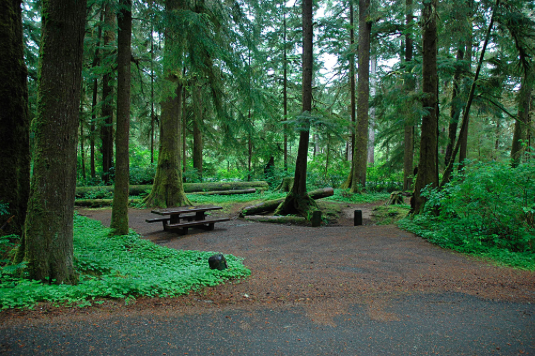 Check HERE to see campsite photos at Mora campground in Olympic National Park. Be sure to let us know what you think, if you’ve ever visited one of these campgrounds, or if you have others you’d like to suggest!